Assembling the trumpet is easy! Gently remove the trumpet from its case along with the mouthpiece. Put the mouthpiece into the receiver and gently twist it into place. To remove the mouthpiece, gently twist it out of the receiver. Do not force or bang the mouthpiece as it will get jammed. Place the trumpet back in its case and remember to do your case up correctly. The trumpet is a versatile instrument. It’s the champion of the brass section with its imposing sound, range and temperament. The trumpet soars above an orchestra, bedazzles within a jazz group and leads the way in a concert band with its sweet melodic tone and razor sharp articulation. 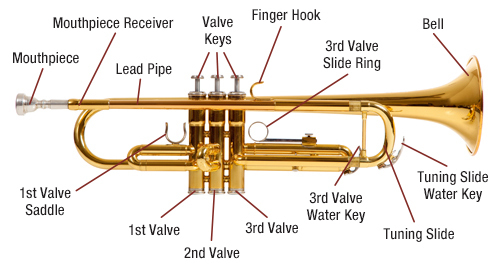 What type of trumpet does my child need? When you are first starting out on an instrument, your child just needs a basic student model of their chosen instrument. The trumpet you will start on will be a B-flat trumpet. Some brands and models that are perfect for students starting out are: Yamaha YTR2330, Jupiter 606ML and Carol Brass CTR-2000H-YSS-BBL and BACH TR300.